For the past two year's Jon Scieszka has been the first Ambassador of Young People's Literature. He's given talks to numerous groups of all ages, he's given book recommendations, and he's supported and advocated for children's lit. A new ambassador will be named January 5th and I'm eager to see who it'll be! But today we're saying goodbye and thank you. So join in and celebrate Jon Scieszka as our first ambassador-hosted by A Year of Reading. Jon Scieszka has been a long time favorite author of mine. 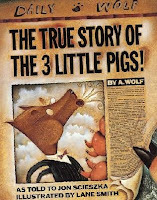 I grew up reading The True Story of the 3 Little Pigs and Stinky Cheese Man. I seriously never get tired of reading these and they make me laugh every single time I read them. Same for my new favorite Cowboy and Octopus. So being a lifelong Scieszka fan, I was very excited to meet Mr. Scieszka at ALA this past June. I stood in line like a librarian fangirl, and gushed when I presented my copy of The True Story of the 3 Little Pigs to be signed (by Jon Scieszka and Lane Smith-yep, librarian fangirl heaven!) I have to say that Mr. Scieszka was super nice and a delight to meet. He is very funny and was so nice to everyone he signed for-and believe me, it was a looong line. The lady in front of me even had her baby and held him up for pictures like Jon Scieszka was Santa Claus or something. But he smiled and signed books and kissed babies like a good ambassador would do. So thank you Jon Scieszka for your work as ambassador. As a librarian and a reader who enjoys children's and young adult literature, it's good to know there are people out there advocating for us and for the books we believe in. Good luck and here's to many more books by one of my favorite children's authors! Jon sound awesome! Thanks for the author/book info. I love the moniker "Librarian fan girl!" Bethany-I hope you check out his books-they always make me laugh. Thanks for that sweet tribute, GreenBean. I love that you are out there luring kids into reading with tasty (sort of) bits from KNUCKLEHEAD. And you actually uncovered the truth – my job is a lot like Santa Claus's. I've loved hearing about his exploits for the last two years. I don't think they couldn't have picked a better ambassador. And he even commented here!